Celery is an excellent source of Vitamin C, Potassium, and Fiber. Moreover it provides plenty of Vitamin K and is said to have cholesterol-lowering benefits. The first time I had a celery smoothie, I was somewhat skeptical of the flavor. Now I buy a big bunch of celery every time I go to the market. This is one of the smoothies I make for friends who have never tried a green smoothie before. If you want to convince your friends or family this might help to sway them. Even Women’s Health Magazine agrees and just featured my recipe on their homepage! Add all ingredients to blender (for the best tasting smoothie use a powerful one like Blendtec or Vitamix). Blend on high until smooth. OK – I’m sold. I happen to have coconut water (I made chocolate pudding with dates, cocoa, and young thai coconut meat a few days ago) just waiting to be used, and bananas & blueberries in the freezer. And I always have celery lying around. I would typically make this with parsley instead of celery (gram-for-gram, I’d put parsley up against pretty much any other leafy green – which is why I grow so much of it in my garden), but I haven’t tried celery yet, and I HAVE been reading about it. Hey Siobhan, that’s awesome! Parsley is one of my favorite greens in smoothies actually. 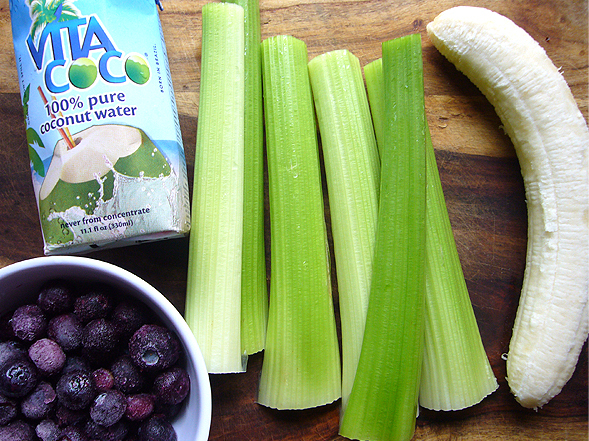 But definitely give this celery smoothie a shot, it’s super tasty. And I agree, I always have celery lying around as well and it’s nice to use it for something different. Hmm – today’s smoothie includes a bunch of kale and a stalk of celery – I think it may take me a while to get used to the celery flavor. Of course, it also took me a while to get used to spinach, kale, and parsley, and now I love them all. Yeah I know what you mean. Some greens take longer to get used to. Although for me, celery was one that I liked immediately. I used an avocado in place of the banana and the flavor was definitely missed. After adding two scoops of my Hammer Recoverite in chocolate (I did weight training today, so I needed the extra protein boost) it made it very good! I have a cheap blender. Any tips on how to not get the stringy celery bits?? Hi Elissa – I know, having a high-speed blender helps if you drink green smoothies 🙁 But I had this same problem at my mom’s. What I did was blend the mixture on the highest speed and a bit longer than I would with my BlendTec. I still had stringy celery bits, so I poured about 1/2 of it through a sieve and drank it with some ice. Hope this helps! 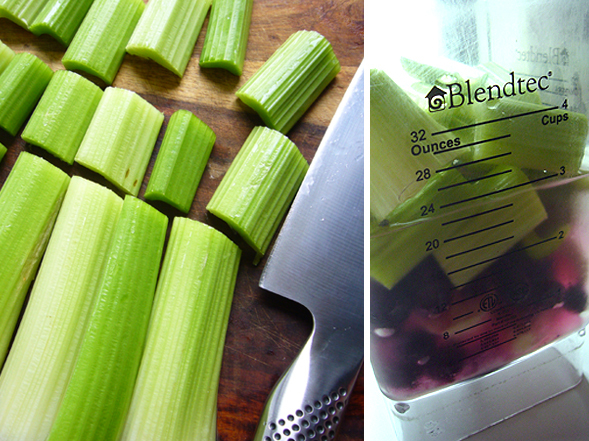 Break the Celery in half before cutting it. The stringy bits will still connect the two halves. So you can peel it away. Then onece the string is gone start chopping. I am in love with your smoothies!! My 8 yr. old boy has both autoimmune disease and autism and many food allergies and hates veggies!! Smoothies, canned tomatoes on pizza, and sweet potato fries are the only way to get them into him. This is a great way to get more potassium into kids with low muscle tone, which makes them stronger!! I am going to show him the recipes and see if he will make them with me, and hopefully not faint in the process. 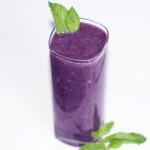 the photos are beautiful and make the smoothies appealing. thanks! 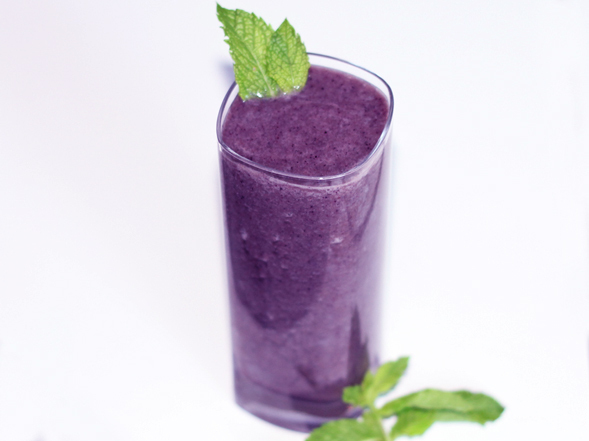 This smoothie was great for a beginner green smoothie eater. My 2 year old son loved it, and it made great popsicles! Thank you! I forgot to say that I only used 2 stalks of celery because I wasn’t sure if it would be too strong for a beginner. Loved it, and I am trying more new smoothies all the time! Thank you for the recipe. I learned some new things about celery, such an under appreciated vegetable, I think. That being said, this is not a great beginner green smoothie. I think that spinach-banana-mango is a great beginning combo. This tastes like celery in a cup! The longer it sits the more the blueberry flavor comes through, but it is too strong for us in the celery flavor. Yum! I love the use of banana and coconut water – how great for electrolyte balance! what a wonderful smoothie can’t wait for breakfast tomorrow now! my husband says I can never follow a recipe and he’s right. I tried this recipes with strawberries instead of blueberries and since I need to have two vegetables in my smoothies I added baby carrots. I put half the amount of coconut water and substituted the rest with regular water. this was my first celery smoothie but it was delicious. I definitely will be making this again. Hi Yoli – Thanks so much for your comment. Sounds great, I’ll have to try adding baby carrots next time!